91% of students say INTER-LS 210 prepared them for an internship, research or volunteering. This course fits best for first-year students, sophomores and juniors, but is open to students of all academic levels. Learn more at the Course Guide on MyUW. Share with students in classrooms, residence halls, online and via email. The goal of this course is to give you the tools you need to be able to seek out knowledge and skills as you make future career and life decisions. You will learn, as a liberal arts and sciences student, that your education enables you to develop the skills and capacity to become leaders, innovators, and entrepreneurs. Through critical reflection and dialogue, we will review a number of theories that pertain to personal career development, and learn how to apply them as you proceed through your academic journey. Over the semester, you will produce an ePortfolio in which you will track your personal growth and progress demonstrate your ability to apply these theories, and produce job tools that you can build upon in the future, such as an internship/job application, skills assessment, and interview of a professional. Regularly engage in critical reflection on their curricular path, their extra-curricular experiences, and their career goals throughout their experience at UW-Madison. Effectively mobilize conceptual knowledge about the meaning of a “liberal education,” the college labor market, and various theories of career development. Analytically evaluate diverse information sources in exploring competing interests, strengths, and challenges that connect to various opportunities for education and work. Efficiently practice instrumental skills of career research, professional networking, and personal branding, through persuasive oral, written, and online communication. Confidently access and mobilize resources among many high-impact practices, career advising experts, and alumni networking opportunities that UW-Madison has to offer. Looking for more classes to set you up for success after graduation? We’ve got ’em! This 3 credit course covers similar themes as INTER-LS 210, but you’ll dive deeper and get even more experience. Plus, INTER-LS 215 fulfills your Comm B requirement! Learn more. Got (or getting) an internship? Get credit for it! 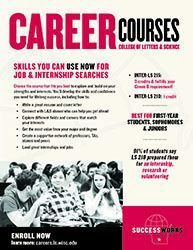 This course helps you get the most out of your internship by connecting your experience to academics, through critical reading, writing and observation skills. Learn more.